I’ve spent a lot of nights sleeping within spitting distance of the Little Missouri River. God willing, I’ll spend a lot more. I’m pretty sure I’ve slept there in every month on the calendar. Some nights (and some months) were better than others. I’ve slept there alone, I’ve slept there with canoeing buddies, I’ve slept there with wives, with kids, with dogs, with a herd of bison trampling through my campsite, with coyotes howling, with a full moon and a new moon. I’ve slept there on bare ground with nothing above me but stars, and I’ve slept there in a tent, in a camper, on top of my sleeping bag on hot summer nights and buried under layers of blankets on cold winter nights. I’ve slept there in howling winds, and nights when just the slightest breeze rustled the cottonwood leaves above me. I’ve slept there sober and not so sober (those were the nights with my canoeing buddies), I’ve slept there with aching legs exhausted from bushwhacking through the Bad Lands all day, I’ve slept there with arms so tired from paddling into the wind I can hardly raise myself in the middle of the night to answer nature’s call. I’ve slept on the west bank, the east bank, and islands in the middle of the river. And every one of those nights was better than any night sleeping INDOORS, in a soft, warm bed in winter or in a summertime air-conditioned bedroom. Most recently, I slept beside the Little Missouri River snuggled against my wife Lillian under layers of down sleeping bags on December 23, 2016, a cold winter night in the North Dakota Bad Lands, with warnings of the “blizzard of the year approaching” ringing in our ears. I’m saying right now, out loud, it was one of the best nights of my life. We were on the tail end of a three-day pre-Christmas Bad Lands getaway, something we try to do every year but don’t always succeed. The day before we had explored the “Grand Canyon of the Little Missouri River” in the North Unit of Theodore Roosevelt National Park, where the ranger told us, when we stopped at the visitor center, we were Visitors Number 6 and 7 to the Park that day. Except for the small herd of bison which created a temporary traffic jam on the Park’s scenic drive, we pretty much had the Bad Lands to ourselves that afternoon, and after watching the sun set over the snow-covered river valley, we headed for, appropriately, the Roosevelt Inn in Watford City for the night. The Inn’s owners have turned the place into more than just a comfortable motel—it is a great Theodore Roosevelt museum onto itself, with hundreds of photos, documents and artifacts lining the walls throughout the motel. We spent more than an hour just looking at the display before supper at Outlaws’ Bar and Grill in downtown Watford City, a great small-town restaurant whose menu includes a 54-ounce “long-bone ribeye steak” (allow 45 minutes for cooking, the menu says). We awoke early in the Roosevelt Inn the next morning and wandered back roads to Theodore Roosevelt’s Elkhorn Ranch, some 30 miles south, where we spent the daylight hours setting up camp, hiking, reading, gathering firewood, snacking, taking pictures, and just absorbing the Bad Lands experience, the sky as blue as blue can get, the ground covered with a blindingly white blanket of snow, about six inches deep, decorated by meandering tracks of river-bottom deer and the THUMP thump thump pattern of jackrabbit tracks heading toward the tasty bark of creekside willows. In all the hours we were there, about the only sound we heard was a rancher feeding cattle with his loader late in the afternoon. Winter birds were scarce, perhaps already hunkering down as the barometer dropped in advance of the oncoming storm. I had hoped to see a shrike, a bird Lillian had introduced me to on our first winter visit there together almost 15 years ago. The shrike that flew by us that day, Lillian explained to me, was probably looking for a field mouse which, if successful, it would likely impale on the government-built barbed wire fence or a sharp twig in one of the ancient junipers as a sort of “cache,” to which it could return again and again for small bits of flesh to sustain it on cold winter nights. No such luck on this trip. We had to settle for some crows (a distant shrike relative), a few flocks of sharptails, and two golden eagles floating high above us on thermals, looking for their own food source, perhaps one of those jackrabbits that left their tracks in the snow. 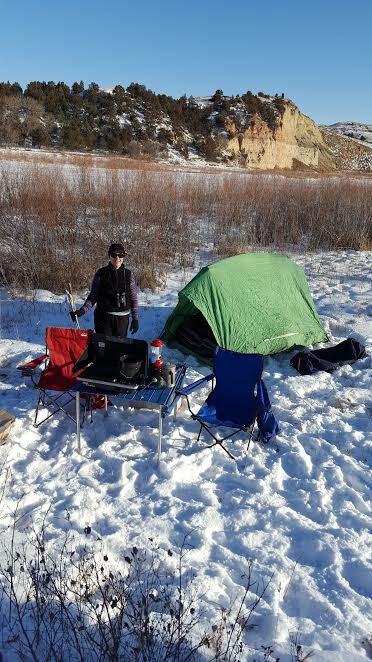 Lillian setting up our campsite beside the Little Missouri. After setting up camp on the frozen Little Missouri riverbank, we enjoyed a short sliding hike on the snow-covered river before I decided it was time to gather firewood for the coming chilly night, and Lillian set off on her own on the ice into the Bad Lands, as she often does, to clear her mind and collect her thoughts and sink deep into the soul-refreshing place she’s called the “center of her universe” since her childhood days on the family ranch on Deep Creek, a Little Missouri tributary a hundred or so miles south of here. Firewood gathered (not enough, as it turned out later, leading to an early bedtime as the fire ebbed), I sat down with a small glass of wine and my book of choice for the trip, Bernd Heinrich’s Ravens in Winter, in perfect sunlight, the temperature hovering just below freezing but with no wind, making it wonderfully comfortable for an hour of reading as the sun sank slowly behind me and lengthening Bad Lands shadows danced on the snow-dusted buttes across the river from me. Just as the sun was approaching the Bad Lands horizon, Lillian returned with her own secrets, including a tale of a chance encounter with the rancher and his hired men out feeding cows, who must have wondered what on God’s green (now white) earth would a woman be doing out walking alone in the Bad Lands in the middle of no damn place, in the dead of winter. Just to make sure she was okay, the rancher stopped by our campsite on his four-wheeler just before dark, a nice friendly North Dakota gesture. Supper was some second-time-around thick soup, enough when re-heated on our Coleman stove for two bowls each, with breadsticks for dipping, and wine for washing it down. There was no finer meal served nor appreciated anywhere in North Dakota that night, I am sure. The bed Lillian had made for us consisted of four self-inflating air mattresses, two atop two more, covered by a heavy cloth summer sleeping bad for a bottom bedsheet, and for our covers, two unzipped winter sleeping bags providing about six inches of down cover against the cold of the night, which turned out to be only in the low teens. We slept like babies, but at 5, Lillian shook me and said she simply could not lay there any longer, wanting to get up and see what the day in the Bad Lands—Christmas Eve day—was to bring us. It first brought us hot coffee, which should have cleared our heads and the sky above us, but it turned out a heavy ice-fog had moved into the valley of the Little Missouri River, and it followed us all the way to town where we had a hot breakfast. I hesitate to end the story of this great trip on a sour note, but I’d be remiss if I left you thinking all was rosy in the Bad Lands that day. There are many threats to our Bad Lands, and on Christmas Eve Day 2016 the sky just north of Theodore Roosevelt National Park was blackened by a huge plume of thick dark smoke, coming from the site where the Belle Fourche Pipeline company had recently spilled nearly 200,000 gallons of crude oil into Ash Coulee Creek, a tributary of the Little Missouri. We drove toward it and found the smoke was from the cleanup of the spill. They had set the land and the creek afire, as their way of removing the oil which had not already sunk into the ground or been trapped beneath the ice. Smoke from the oil burning in Ash Coulee Creek on December 24, 2016. 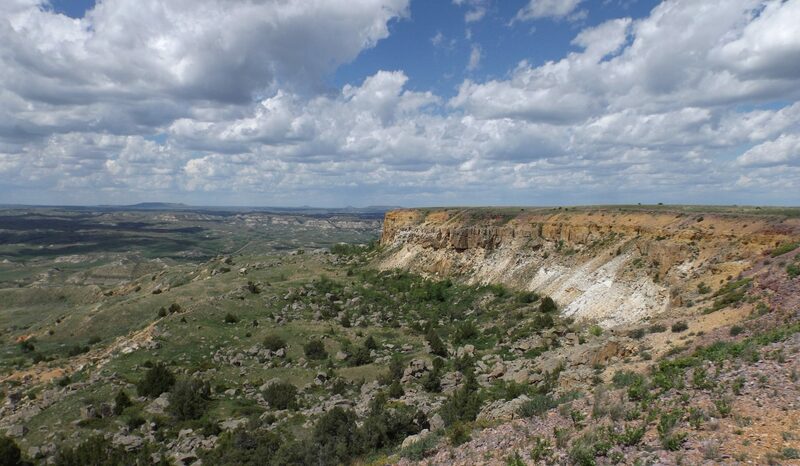 The site is about 9 miles north of Theodore Roosevelt National Park’s South Unit. What would Theodore Roosevelt think, we wondered, if he were here to witness this scene? What would he think of us, as Americans, for letting it come to this? We have not done as he instructed. That was evident, watching the story of this massive environmental blunder unfold before us. This would make him sad. Well, shame on us. How much longer we will be able to enjoy the beauty and solitude of the Little Missouri River valley, as Lillian and I had just done, depends, I think, on our willingness to do as Roosevelt said: Inquire Seriously. Starting now. I bow to the elegance of your prose, the depth of your understanding, and the strength of your commitment my friend. Strive, Serve, and Do Not Yield.